John Gillis, who has a distinct quality of being an interface between humanity and thought, calls us to attend to interfaces, ecotones, meeting places of ecological and cultural differences. He argues that from cells to states, interfaces are porous, and full of possibility. “Margins” are not margin-al, rather, they are zonal, full, places unto themselves. Places to be, to build, and to pay attention to. This invitation to shift perspective – the educators’ magic carpet – literally sky-rocketed my conception of the possibilities at interfaces. In David Christian’s Big History, Maps of Time, he argues that it is the temperature differentials in space that are catalytically creative, gestating galaxies, and generating longue-durée cycles of creation and destruction. Similarly, differences in temperatures and air pressure drive the climate system on Earth. Gillis noted the vertical, as well as horizontal, dimensions of ecotones. He suggested that the verticality of the ecotone joining land and sea surfaces with the atmosphere has taken on a new significance with climate change. It is perhaps the last large ecotonal place which humans must actively collaborate with in our evolution. The energy we have cajoled and coerced the Earth to resurrect in the form of fossil fuels makes the conceptualization of “human climate” that much more poignant and physical. However, aside from this concrete dimension, climate is something that humans imagine and construct in our minds, based on our experiences of place, at the invisible conjuncture of nature and culture. There is no climate without the myriad ways we interact with weather on a daily basis through our technologies of seasonality, from snowshoes to Christmas/festivals of light, which make us at home in our particular climates, and which mediate their potential effects. 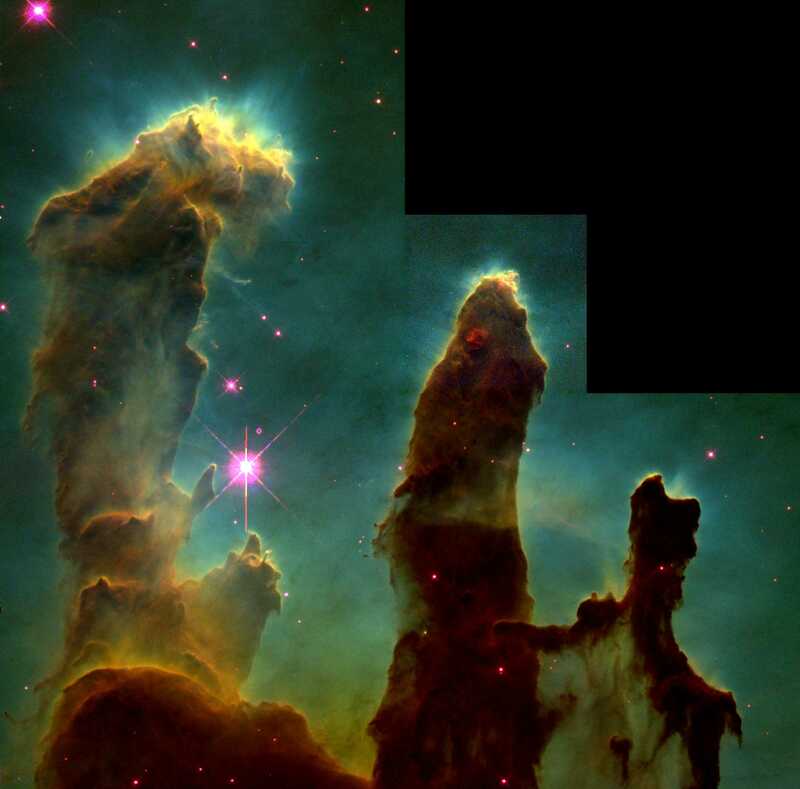 “Eagle nebula pillars“. Licensed under Public domain via Wikimedia Commons. Over the past 30 years, scientists have risen to the challenge of studying the interface of Earth-sea and sky. They have deepened their knowledge of ocean-atmospheric circulation systems, which mediate much of the vertical activity in this ecotone. Global Circulation Models (GCMs) of the Earth’s climate systems have become increasingly nuanced to incorporate the heat exchange between sea surface and atmosphere, and to reflect the processes of cloud formation. A complete understanding of the latter processes continues to stymie researchers. Some scientists used to think that atmospheric warming would be moderated by the Pacific Ocean, envisioning its capacities as a robust heat sink. Scientists are now recognizing that they do not fully understand the potential results of ocean warming. In a recent study, Yair Rosenthal, Braddock Linsley, and Delia Oppo found that for the past 60 years, the middle layers of the Pacific Ocean have been absorbing heat at a rate 15 times faster than they have for the past 10, 000 years. Scientists are also studying the negative effects of ocean acidification on crustaceans, and observing changes in the stratification and circulation of water columns in the ocean. Changes in ocean temperatures and circulation could shut down the Gulf Stream and cool the landmasses of eastern Canada and Northwestern Europe. Scientists do not completely understand the way that the various ocean circulation systems interact with one another. What is clear is that with more heat in circulation between the oceans and atmosphere, patterns of precipitation formation and deposition are changing. Heavier rains fall in a shorter period of time, and sometimes at a different seasonal juncture, than they would have under an earlier climatic regime. Humans are thus recognizing and experiencing the diverse ramifications of the increased heat circulating at the ecotone of Earth-sea and air. The concept of the forest and other types of plant cover as “carbon sink” is similarly complicated by the fact that trees and other plant life at the interface of Earth-sea and sky do not absorb carbon dioxide at a constant rate. Rather than performing a steady “ecosystem service,” the biochemistry of forests changes depending on the temperature, as well as the amount of moisture available. Given the multitude of scientific models for future temperature and precipitation regimes, it is unclear how much different types of plant cover and agricultural practices will be able to mitigate the effects of greenhouse gas emissions. However, carbon trading and offset schemes rely on certain assumptions about plant cover as a “carbon sink”. The concept of carbon sinks which can be accounted for in climate models, and used to inform the structure of carbon markets, necessitates the commodification of commons, whether oceanic or terrestrial. Turning commons in particular parts of the world into global commodities is troubling for a number of reasons: it perpetuates the asymmetrical power relationships between the so-called Global North and the Global South; it ignores biodiversity and the need for other species to have viable ecosystems in which to live; it obscures the interconnectedness of the planetary system. For example, if ocean acidification continues, with the anticipated result that some types of phytoplankton will be unable to form firm shells from calcium carbonate, the marine food web (which depends on phytoplankton) will become unsteady. The ability of the oceans to ‘trap’ carbon will be altered in turn. The ramifications of changes to the life-supporting capacities of oceans and lands are far-reaching, and there will be some effects that humans cannot anticipate. Like trees, humans link the Earth’s surface with the air; social and ecological anthropologist Tim Ingold characterizes us as ‘enwinded’ as well as ‘embodied’ beings. Whereas technocrat politicians and scientists imagine that humans can consciously engineer the heat exchange within this ecotone, and prevent the system from tipping too far towards any extreme, others are less confident about the types of actions humans should take in this crucial zone. Multiple issues are at stake, including the extent to which models of the Earth’s surface-air interface fail to incorporate human cultural and social as well as subsistence responses: the human dimensions of change at the ecotone of Earth and sky. Historian of climate models, Paul Edwards, notes that once a certain amount of atmospheric warming has occurred, there is no way to predict how the climate system will behave. As the authors of a chapter titled “Knowledge, Uncertainty, and Wisdom,” argue, more knowledge does not necessarily lead to wisdom, defined as “the capacity…of judging rightly in matters relating to life and conduct. It requires not only knowledge but reflexive awareness of alternatives or choices, along with awareness of standards as well as context.” Wisdom, then, is about applying pertinent information in a particular place and time, within the larger moral, cultural, intellectual, and material context of the moment. It requires values as well as vision. How might we envision conscious evolution with an ecotone? Evolution is another concept that people often imagine hierarchically, despite our recognition that the tree of life branches outward in all directions; for example, so much life would be impossible without mycorrhizal fungi, underground super-conduits for water, nutrients, and information. Biologist William Rees, co-creator of the ecological footprint concept, argues that our evolution now requires exercising our human capacities for “evidence-based reasoning and local analysis,” “moral judgement,” “compassion for other individuals and species,” and “long-term, forward planning.” Local, moral, and long-term. While these ways of thinking and living are often central within families and communities, they overlap with far less frequency within the priorities of politicians and their corporate counterparts at international climate change negotiations. However, some politicians and NGOs in the Global South call for local, just, and sustainable responses, as do the broader civil society movements which have coalesced at People’s Summits in tandem with IPCC negotiations (and with the meetings of other international bodies such as the World Trade Organization). Just as Gillis argues that the cultural and ecological diversity at shorelines fostered innovation and change in human cultures, the institutionalization of attention to the Earth-sea-sky interface forges spaces for diversity and foregrounds differences in ecological and economic resources, perspectives, and needs. While international, these civil society gatherings facilitate the exchange of local ideas and innovations, and are rooted in a moral economy which extends spatially and temporally. As Tor and Anders Sandberg detail in their account of COP 15 (the IPCC meetings in Copenhagen in 2009), civil society groups called for the further establishment of “networks of cooperative need-meeting structures.” Gillis argues that human cultures at ecotones are more resilient to change and hazards, because of the experience and resources their position offers. “Networks of cooperative need-meeting structures” sound like the mechanics of a system that fosters resilience and connectedness among groups with unequal access to resources and different needs. Some climate justice advocates talk about the need for the so-called Developed Countries to pay a “climate debt” to their ‘Lesser Developed’ counterparts. Those who contributed heavily to the current havoc in the climate system now need to support the Lesser Developed Countries in dealing with the ecological and economic challenges resulting from systemic global disparity. As the amount of heat and moisture circulating at the interface of Earth’s surface and atmosphere has led to scientific understandings about the processes of exchange within this ecotone, it has also emphasized the need for greater parity in the volume and character of exchanges between human beings in different societies. The call for a more equitable distribution of the means for industrial power generation points to the need to equitably distribute political, economic, social, and cultural power, among the world’s peoples. Historians and other scholars in the humanities and social sciences are also calling for more attention to the role of culture in mediating the interface between human societies and physical climate. Thinking about the verticality of the interface of Earth-sea and sky highlights the interconnectedness of atmospheric, cultural, economic, and political systems. Rees’ recommendations about addressing environmental challenges by using our intellectual and emotional capacities are a useful reminder that wisdom comes through scientific and experiential knowledge only when it is produced and applied in collaboration with the communities most affected by environmental change. I am working on an article reviewing the state of historical climatology and climate history in Canada which discusses the increasing emphasis of historical scholarship on cultural dimensions of climate; Gillis argued for the term “human climate” in the workshop session on my article at the Northeast and Atlantic Canada Environmental History Forum 2014, University of Prince Edward Island, Charlottetown, August 2, 2014. “Pacific Ocean waters absorbing heat 15 times faster over past 60 years than in past 10,000” October 31, 2013, http://phys.org/news/2013-10-pacific-ocean-absorbing-faster-years.html. Chris Wood, Dry Spring: The Coming Water Crisis in North America (Vancouver: Raincoast Books; Berkeley, Calif.: distributed in the US Publishers Group West, 2008), and Tor Sandberg and Anders Sandberg, Climate Change – Who’s Carrying the Burden? : The Chilly Climates of The Global Environmental Dilemma (Ottawa: Canadian Centre for Policy Alternatives, 2010), 48. For discussion of a law-suit launched by youth and non-profits Kids vs. Global Warming and WildEarth Guardians charging American governments at the federal and state level with failing to protect the atmosphere (as a public trust) from damage, see Amel Ahmed, “Youths Sue U.S. Government Over Climate Inaction,” Aljazeera America, May 4, 2014, accessed August 22, 2014, http://america.aljazeera.com/articles/2014/5/4/youth-sue-governmentforclimateinaction.html. For elaboration of how to use the public trust doctrine to launch such a suit, see Mary Christina Wood, “Chapter 6: Atmospheric Trust Litigation,” in Climate Change Reader, eds. W.H. Rodgers, Jr. and M. Robinson-Dorn (Carolina Academic Press, 2009), http://law.uoregon.edu/assets/facultydocs/mwood/atmo.pdf. Tim Ingold, “Earth, Sky, Wind, and Weather,” Journal of the Royal Anthropological Institute (2007): S32. For example, see Mark Carey, “Science, Models, and Historians: Toward a Critical Climate History,” Environmental History 19, no. 2 (2014), http://envhis.oxfordjournals.org/content/19/2/282.full#sec-20. Making and Moving Knowledge: Interdisciplinary and Community-Based Research in a World on the Edge, 22. For the co-creation and elaboration of the concept of ecological footprint, see Mathis Wackernagel and William E. Rees, Our Ecological Footprint: Reducing Human Impact on the Earth (Gabriola Island, BC; Philadelphia, PA: New Society Publishers, 1996). William Rees, “Confronting Ecological Change: What would a Truly Intelligent Species do?” Work in a Warming World Conference, Fredericton, New Brunswick, 2011. For the Gillis references in this paragraph, see John Gillis, The Human Shore: Seacoasts in History (Chicago; London: The University of Chicago Press, 2012), and “Islands as Waterlands,” University of Prince Edward Island, Charlottetown, Prince Edward Island, August 1, 2014. Naomi Klein, “Paying Our Climate Debt,” in Who’s Carrying the Burden?, eds. Tor and Anders Sandberg, 55-69.